One volume, text, unmediated; 178 pages; 24 cm; Sm. 8vo. 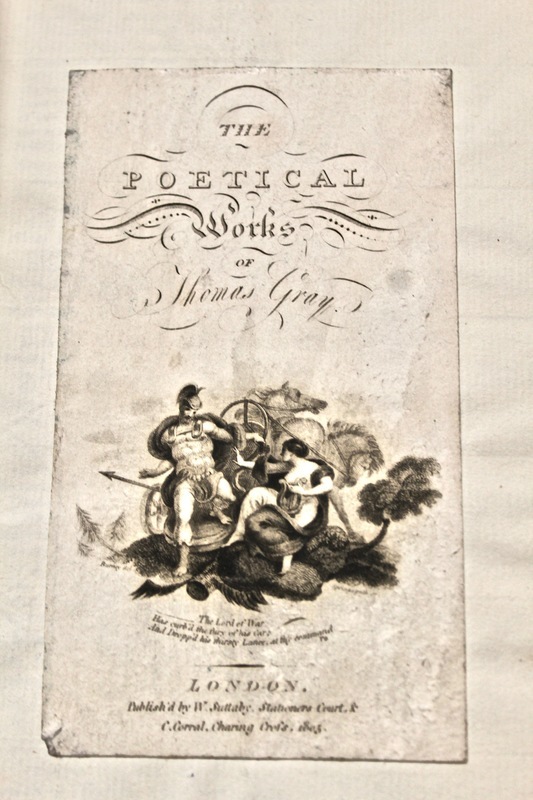 ; new edition; hardcover brown leather binding in good condition, raised cords on spine, most likely rebacked, gold tooling on edges, title stamped "Gray's Poems"; printed in roman typography with single column text, the paper has vertical chain lines; contains many illustrative plates depicting both the author and the contents of his poems; many newer materials have been inserted to the original printing, including plates, text, and autograph letters; while some aging and stains have occured, this book remains in great condition and form. Thomas Gray (1716-1771) was considered to be one of the finest lyrical poets of the mid-eighteenth century. 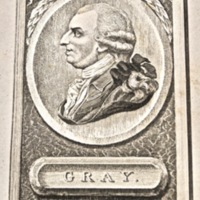 Gray had a very melancholy personality, which is reflected in much of his work. His “Elegy Written in a Country Church Yard”, published in 1751, gave him great fame and recognition, but his further pieces were considered by critics as disappointments. Gray took this reaction very personally, which led him to release only 13 poems in his lifetime. He spent more effort studying philosophy, history, science, art, and antiquities at the University of Cambridge than producing his own creative material. Poems by Mr. Gray is the complete collection of Gray’s published works. 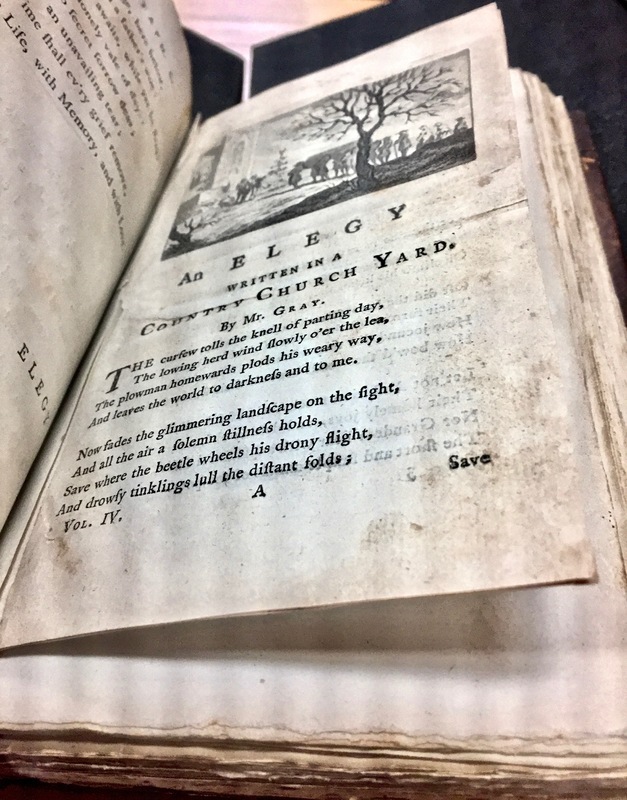 Printed in 1786, 15 years after the author’s death, this book serves both as a portfolio and memorial to Gray’s legacy, as it contains not just his poems, but a short biography, an ode, and his last will and testament. Beautiful artwork is presented at the begining to each poem, depicting a scene or character from the lyrics. Some of these were original, while others had been inserted later on. 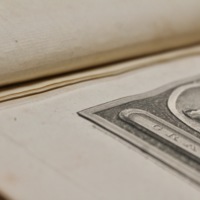 Bound together with the text is the 180 page "Observations on the Writings and on the Character of Mr. Gray", written by Thomas Mathias and published in 1815 (and joined to the first publication sometime thereafter). It provides an analysis of Gray’s prose and reflects on the author’s life in relation to his literature. This addition also contains a memoir to the Reverend Norton Nicholls, who was a friend to both Gray and Mathias. 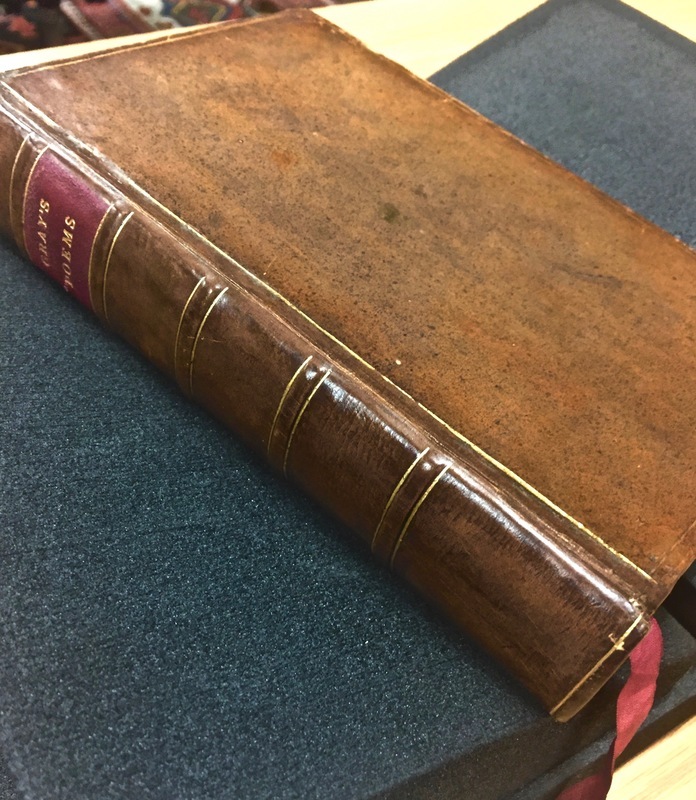 With numerous provenance indentifications, this book has clearly passed through the hands of many owners over its 228 years of existance. 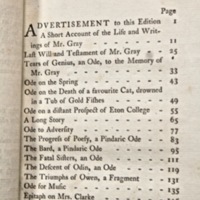 Table of Contents, containing all 13 published works by Thomas Gray. 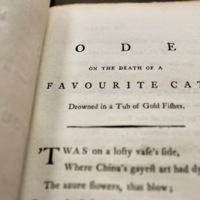 One of Mr. Gray's poems "Ode on the Death of a Favourite Cat" (p.49) written in 1747. Also included in the main text is Mr. Gray's Last Will and Testament (p.25). 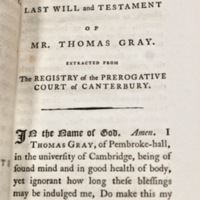 Inserted illustrative plate to memorialize Thomas Gray after his death in 1771. This bookplate found on a front flyleaf (and the only plate inside the book) offers no indication on ownership other than its reference to “The Poetical Works of Thomas Gray”. Interestingly, a publisher name is engraved below the image: "Published by W. Suttaby, Stationers Court, & C. Corral, Charing Cross, 1805". 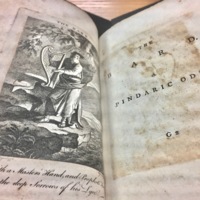 What this information is directed towards is unknown, as the material in Poems by Mr. Gray was printed either in 1786 or 1815. What can be surmised is that this plate was added by someone during or after 1805, maybe as a form of referenece, a change of ownership, a resale indication, or just as a decoration. Example of an illustravtive plate original to the first publication (1786). Example of an illustrative plate inserted after 1786. These additions slightly differencitate in style from the original images and are distinguishable by inscriptions or dates noted on their front or back. 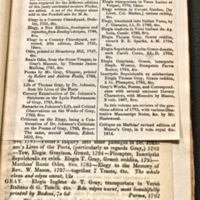 Evidence that pages either had been cut from the text or were meant to hold more inserted materials. 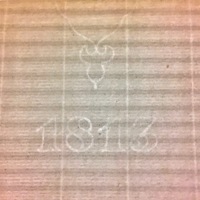 Watermark to the newer section "Oberservations on the Writings and on the Character of Mr. Gray" (1815). One actual piece of reference to ownership can be found by this inscription on another front flyleaf. The initials of the owner, JHA(? 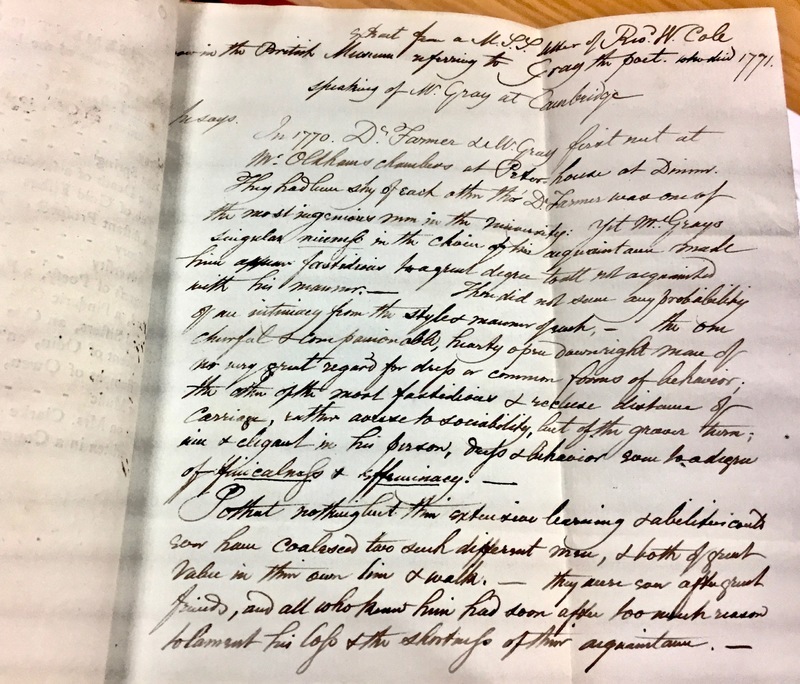 ), and a date, April 26th 1832, are given, as well as a full breakdown on all the book's content at that point in time. This could be an indicator as to when Poems by Mr. Gray was first recived by this particular owner. 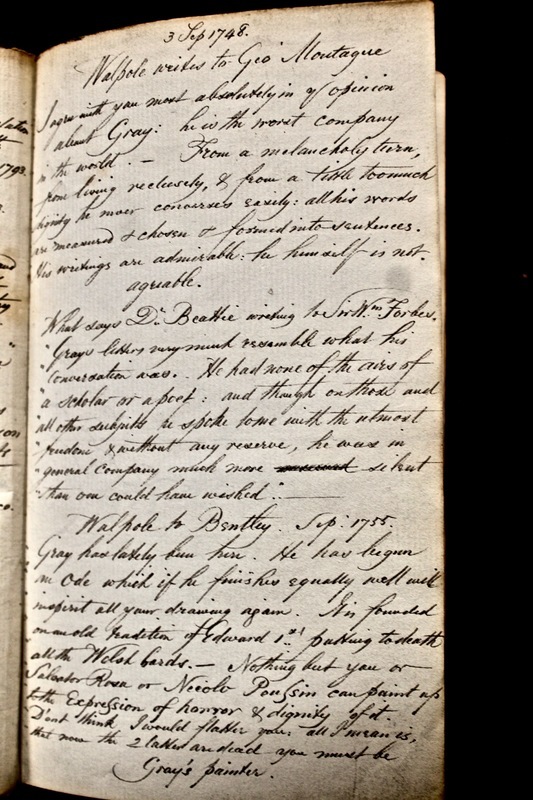 This inscription at the top of the title page appears to be JH Anderson, or JHA. The date April 20th, 1832 also matches to the date previously stated above. JHA initials seen again. This time on the back of an art plate. Dated as December 1, 1852, meaning this owner possessed the book for at least 20 years and made multiple additions throughout that period. Another inscription found on the half-title, dated February 1, 49 (probably 1849). More material from the book is referenced, including an autograph and an illustration, which might hint at when those pieces were attached. If the date is to be believed, then this would be the work of owner JHA. 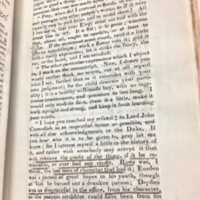 One might assume that whenever a new item was bound with the book, the owner would highlight what was added and when it was added. 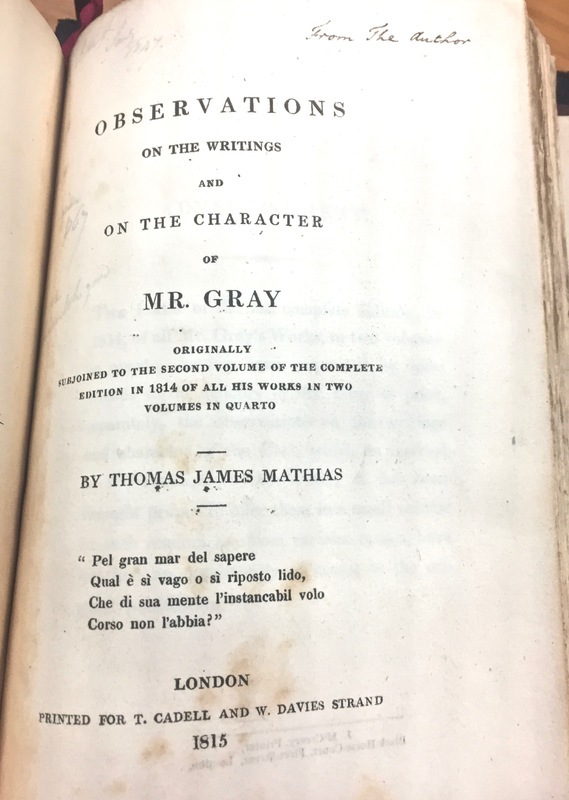 This engraving shows how "Observations on the Writings and on the Character of Mr. Gray" was added to the original printing. The (unkown) owner writes that his father was presented the material by the author, Thomas Mathias, in 1815. 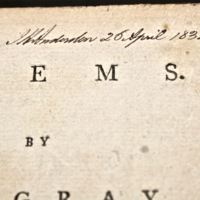 The material was seemingly important enough to bind it with Poems by Mr. Gray, and in effect, makes the signifiance of the book appear more as a reflection on the author's work and a memory to his life than it does as just a simple poetry volume. It would be fascinating to know how and why this transfer of materials took place. Other markings here inculde a mention towards one of the book's autograph, a quote possibly from one of Gray's poems, and some unidentifiable words. 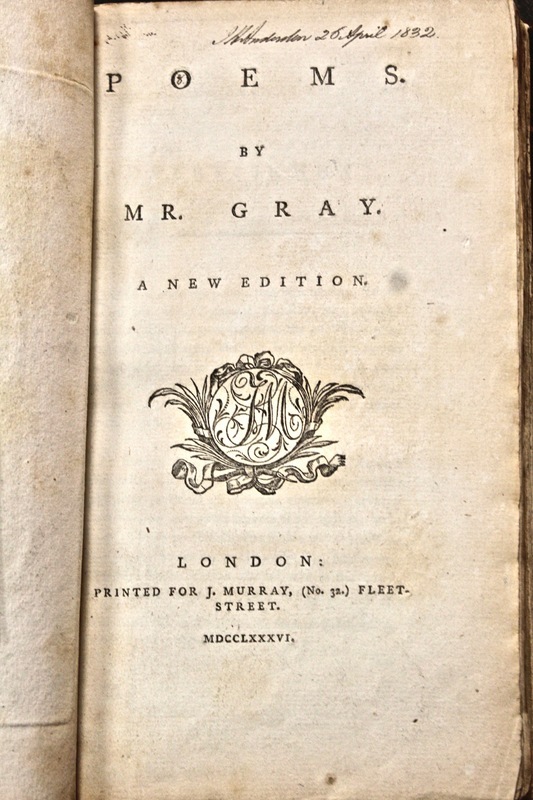 Title Page to "Observations on the Writings and on the Character of Mr. Gray". 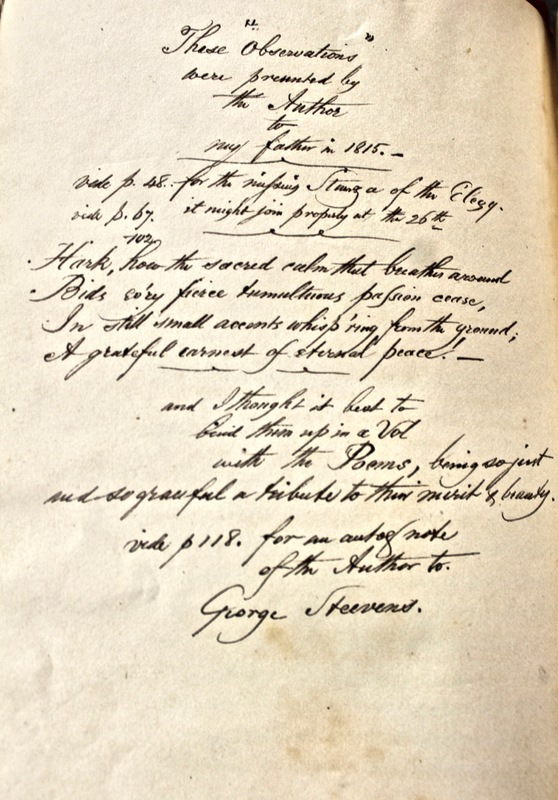 Four suppresed stanzas of "Elegy Written in a Country Courtyard", considered to be Thomas Gray's best written work. 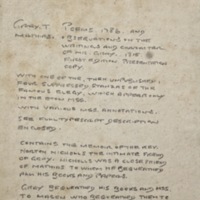 The smaller page size signifies this addtion, and it is placed in front of the book's publication version of "Elegy". 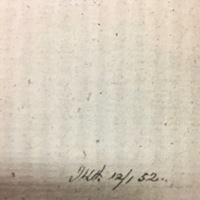 The reason for this placement is unkown, though one explanation might be that this is an important copy of "Elegy", maybe a first or second edition or manuscript version. These are the letters and autographs that have been incorperated into Poems by Mr. Gray. A significant portion of the handwriting is difficult to decipher. 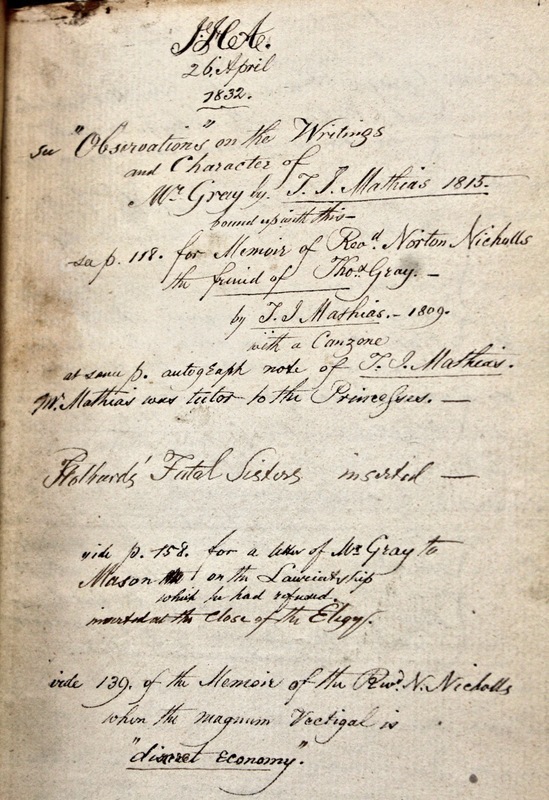 Autograph One - Appears to be a description on a lecture given about Gray that took place in 1770. Autograph Two - A letter to George Stevens from the author Thomas Mathias. Autograph Three & Four - Inscription of letters from Walpole to Geo Moutague and Bantley, dated 1778 and 1755 respectivly. 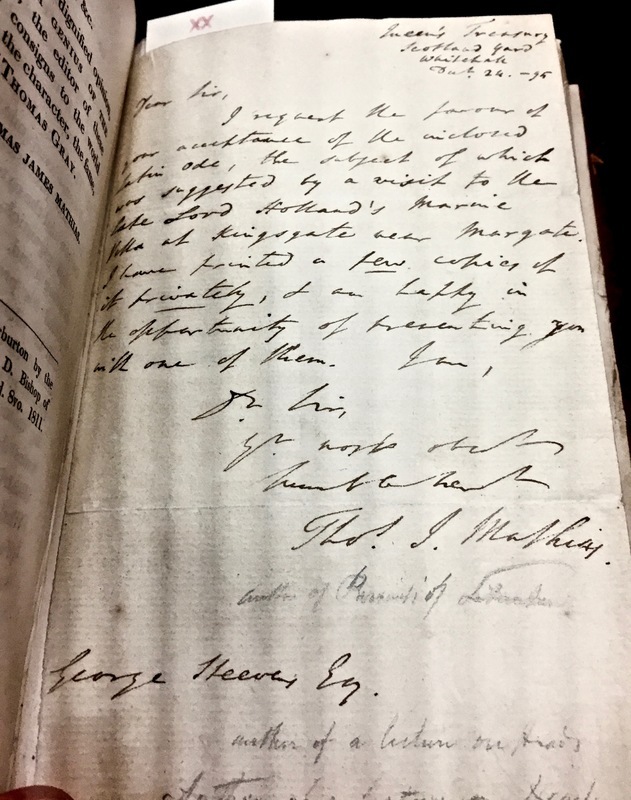 These letters seem to discuss the ongoings with Gray and his work, including personal feelings on his demeanor (which was not reflected on positively by Walpole). 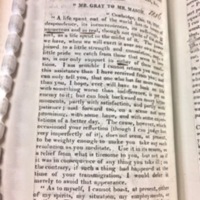 Part of a letter from Thomas Gray to Mr. Mason, evidently cut from another literature source and pasted into this book. An ink marking that doesn't fit with the rest of the typography suggests it was added in 1816. There are also multiple underlined words, which someone must have found to be quite informative for some reason or another, though the context to the importance of this letter is elusive. In it Gray remarks on his current life situation and how he feels on critical reactions to his work, though it can be confusing to understand without background knowlege to Gray's past. Three provenance notes are found within Poems by Mr. Gray. Each gives some material description and two provide possible sale records. The most interesting one is a catalog that lists lots (i.e. an item up for auction) for dfferent pieces of Gray's work. Unfortunately, no date accompanies the inscription, but it did originiate from a place called Strawberry Hill. This was the mansion of Horace Walpole, the 4th Earl of Orford, son of a British prime minister, and author to the autograph mentioned above. Walpole and Gray studied together at university and had a tumultuous friendship. 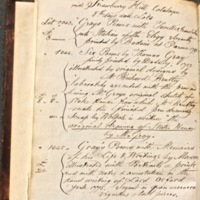 Some of Gray's first poems were made at Strawberry Hill, which had its own printing press. 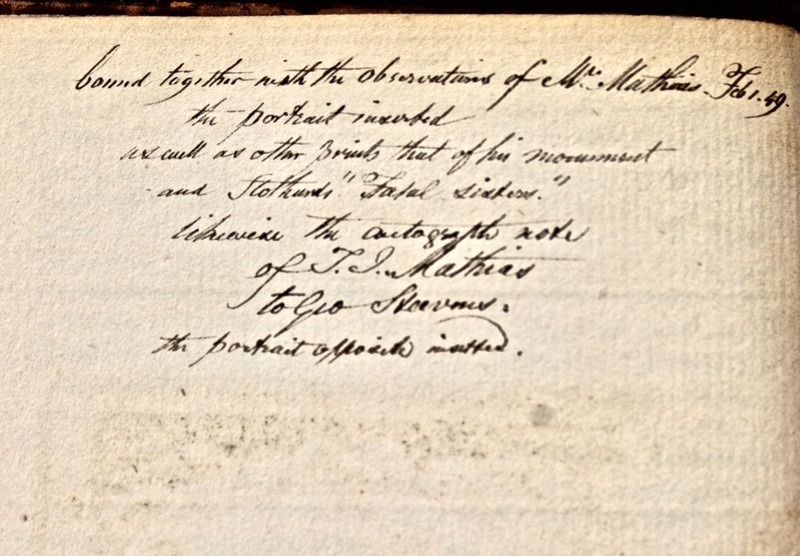 The listing here indicates that Horace Walpole might have been not just a previous owner of Poems, but possibly its first. 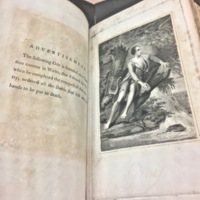 ~ This exhibit page on Poems by Mr. Gray was created by Brandon Armstrong, a student at Michigan State University, with the assistance of MSU's Rare Books and Special Collections and the Thomas Gray Archive. The project was presented to class, History of the Book taught by Professor Liam Brockey, in October 2017.